Moda Fabrics has been in business for 40 years. 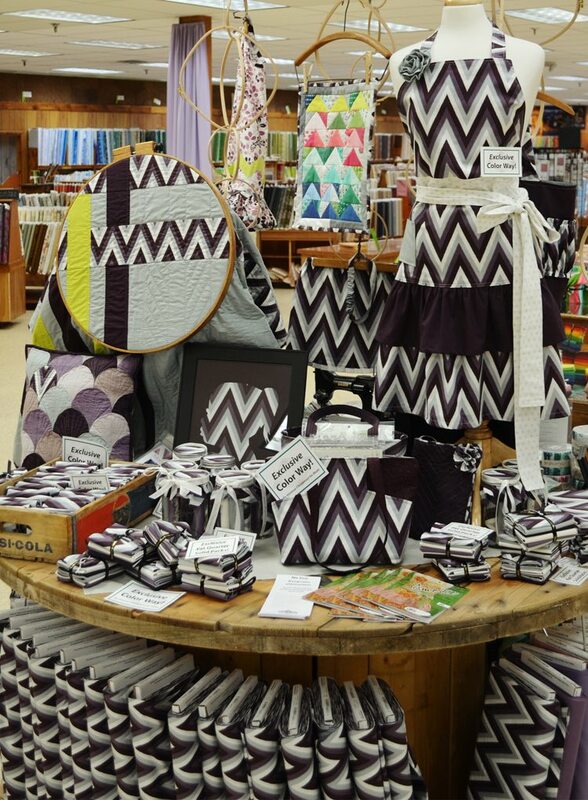 And for well more than half of those years, Yoder Department Store in Shipshewana, Indiana, has been buying Moda fabrics to sell to their customers. Yoder Department Store stands out for its longevity with Moda, but also for its years of operation as a family business. Ora and Grace Yoder founded it as a dry goods store 70 years ago: their grandson is general manager today. The store’s building—aka Yoder’s Shopping Center—originally housed the department store, a hardware store, and a grocery store. Today a café, where customers stop for coffee, ice cream, and lunch, has taken the place of the grocery store and the department store occupies half the space. About 20,000 of its 26,000 square feet is devoted to shoes, linens, and clothing. And, of course, fabric. 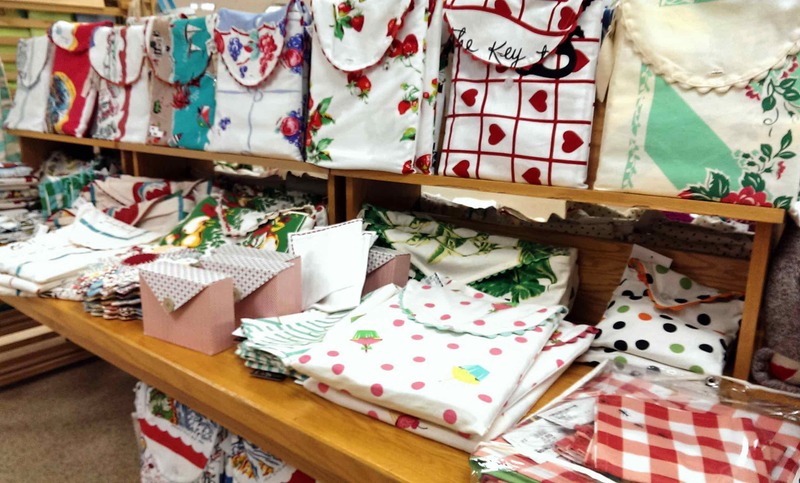 Yoder Department Store’s customers extend far beyond the local community. Shipshewana is a tourist destination, with flea markets, a theater, more than 125 shops, and festivals and special events filling the calendar and drawing visitors from around the world. 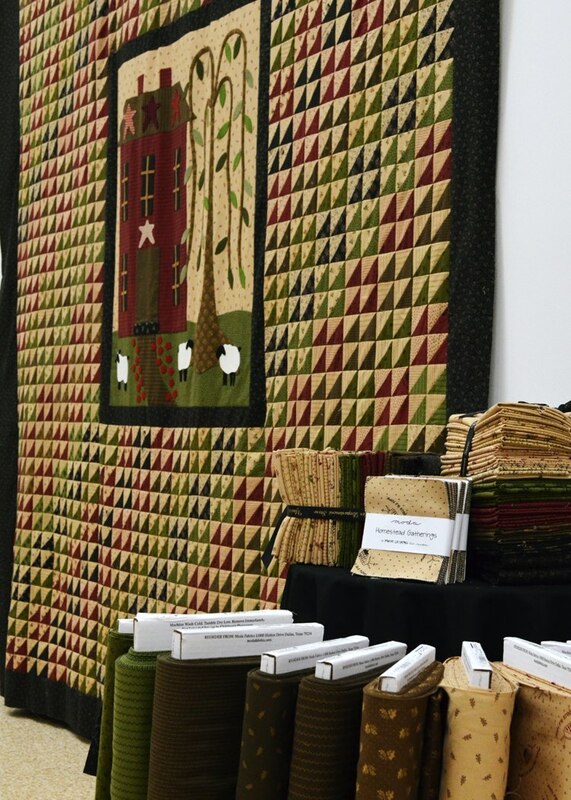 Of special note is the Shipshewana Quilt Festival, now in its seventh year—last year 5,000 quilters attended. 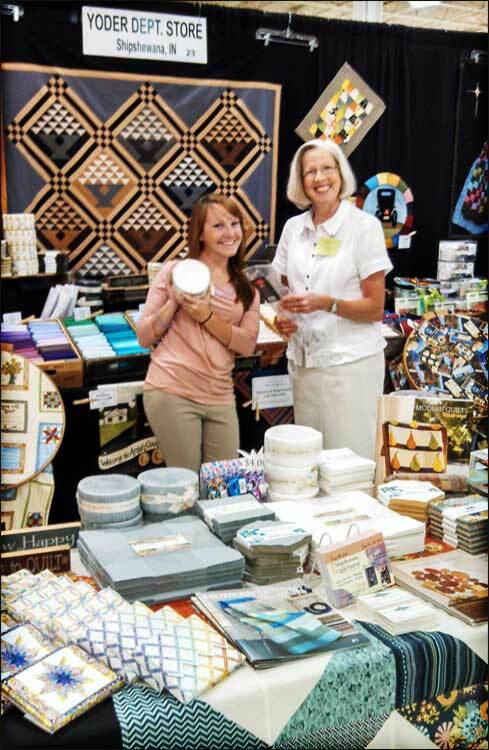 Held in June, the festival includes a quilt show with cash awards, vendors, nationally known quilting teachers, a shop hop, and much more. (For more information on this year’s festival, visit http://www.shipshewanaquiltfest.com/index.html.) Moda is a sponsor of the event, and has produced exclusive fabric for it. “Last year Vanessa Christensen allowed us to recolor one of her fabrics in a more traditional color scheme, and our employees had a contest with it, which helped customers see a variety of options,” says Candice. 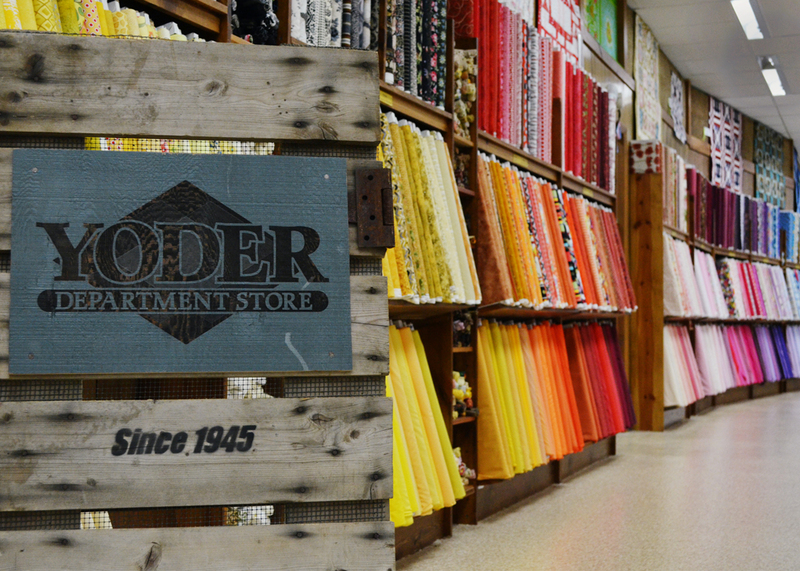 Going the extra mile for customers is what Yoder Department Store’s fabric department is all about. “We carry a lot of hard-to-find items and have loyal customers,” says Heidi McHugh, the store’s advertising and marketing manager. “My grandmother is one of them. She likes to come in and have Nancy help her. She’s worked with her for years.” Employees help customers choose fabrics, draft patterns, and calculate yardage. “We specialize in customer service and want to make sure our guests have a good experience,” says Heidi. Barn Quilt blocks adorn the side of the building. 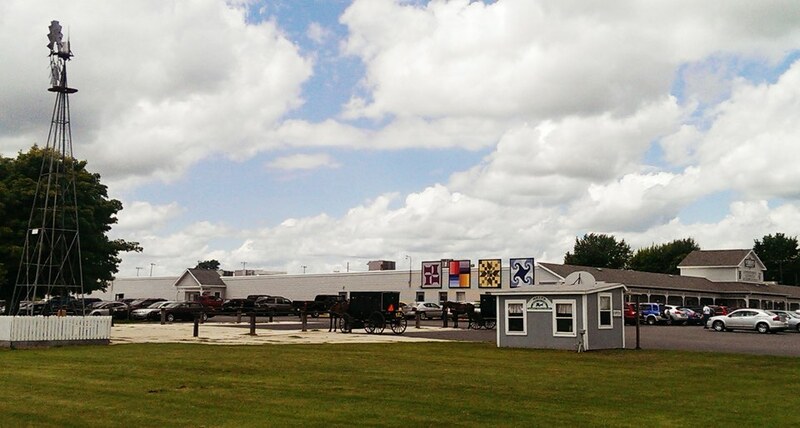 A working windmill is at left and the parking lot includes places to tie up buggies. For more information about the Yoder Department Store, visit their website at http://www.yoderdepartmentstore.com. Hello My name is Oksana Danziger for over 20 years .I really like your company style and would like to work with you .I didn’t find a submission of art work link on your website .Can you please direct me to a submission department. Loved reading about someone who loves Moda Fabrics as much as I do. Great posting. Wishing all who read this a great day. I live in Illinois – thanks for highlighting this amazing store right “next door”. Road trip!! I grew up not far from there. Thanks for featuring a piece of my past. I love Yoders! It’s about an hour and a half drive and well worth it! 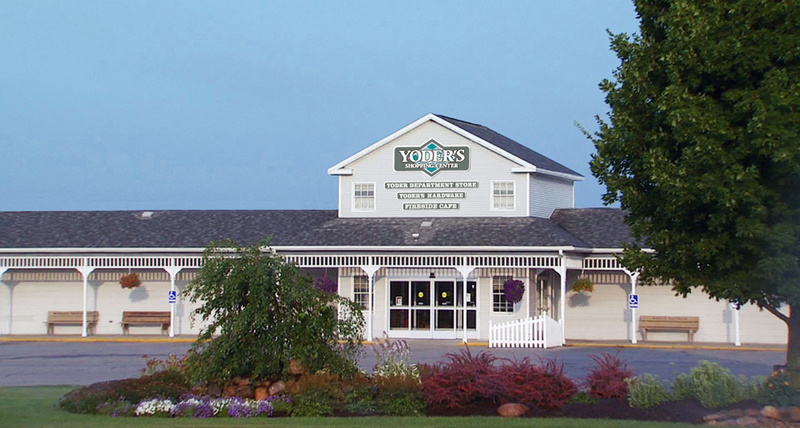 Love to shop at Yoder’s…it’s a wonderful store! Ahhh Yoder’s Dept. Store, I grew up shopping here for clothing fabric. I remember groaning and moaning when we had to go “material shopping”. Now I wish I lived closer, it is truly a wonderful place to shop. I’m from Australia and visited Yoders last September. I thought it was one of the most beautiful shops selling fabric I’d seen, a little piece of Heaven. I hope to go back one day. Thank you for writing about it and bringing back some great memories. I had the pleasure of visiting this store a couple of years ago while visiting my brother. Can’t wait to go back! Thanks for sharing! Passed through there twenty yrs ago. Bought my first lap quilt frame from the quilt side and two Radio Flyer bikes from the store for the grans. Loved it.